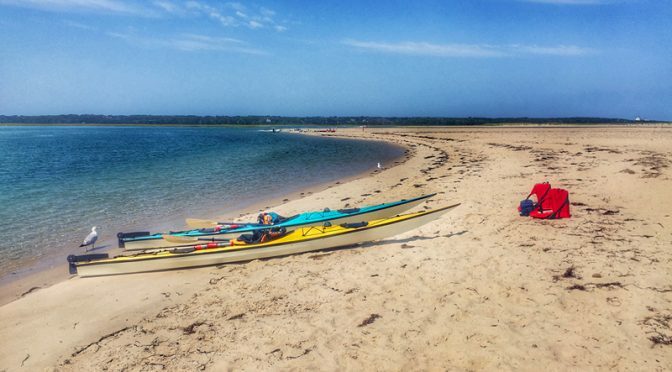 It was another picture-perfect day for kayaking the Nauset Marsh out to Nauset Spit. We launched from Goose Hummock, so it was a nice long paddle. And yes, we did see a few seals along the way. We remembered our folding seats that fit in the hatch, so that was a big treat at lunchtime. Just sit down, relax and enjoy those last days of summer. It doesn’t get much prettier! Previous PostSweet Pepperbush Wildflowers Are Blooming On Cape CodNext PostCan You See The Great Blue Heron In The Tree On Cape Cod?